I have had one particular goal in life since getting married, cook the perfect ribs. 2. I don’t do well with raw meat. You have heard me explain this to you before, particularly in my Slow Cooker BBQ Ranch Meatloaf post. The less handling of raw meat, the better. I am not a vegetarian by any means (although, I can completely respect those that are), but the thought of raw meat sends anxiety through out my body. I like to dump it into whatever its cooking in as quickly and efficiently as possible. This is one reason most meat I buy is boneless meat. Its ready to go. See my other rib posts; Slow Cooker Hawaiian Ribs and Slow Cooker Easy BBQ Ribs for some boneless recipes (although they could easily be made with bone-in as well). 3. I have been long since been trying to redeem myself from my first rib disaster. Story time. A year or two ago, My husband was coming home from a week long business trip and I REALLY wanted to make him a dinner he would love. Ribs are one of his favorite entrees when we go out to eat, so why not make it homemade?! I bought a rack of ribs from my grocery store, followed a random recipe and threw them in the oven. They couldn’t be that hard, right?… WRONG! He walked in the door to a disaster. I opened up the oven and black smoke was every where and the ribs were burnt to a crisp. Literally. I cried. A lot. Being the sweet husband that he is, he tried his best to eat them with a smile, but we ended up chucking them out and ordering take out instead. Ever since this particular experience, he hasn’t fully trusted me to make ribs that live up to his standards. My husband took one bite of these ribs and exclaimed, “YOU HAVE DONE IT! These could be the best ribs I have ever eaten!!! !” There you have it folks! 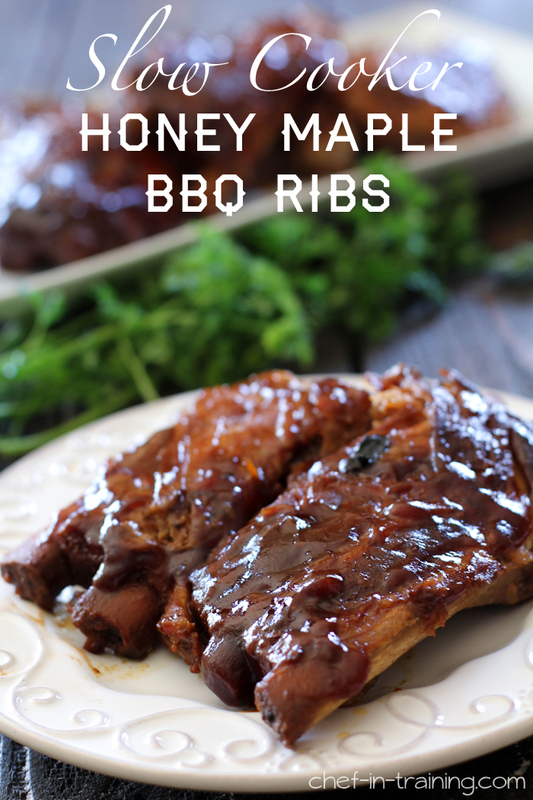 Not only have I redeemed myself, but this recipe may have topped his favorite ribs chart! These are perfectly flavored and fall right off the bone! Season rib rack with salt and pepper. Place and line the rib rack (height wise) in slow cooker. Place the meaty side facing the outer wall of the slow cooker. Rib rack should curve with the wall of slow cooker. In a medium bowl, combine honey, mustard, real maple syrup and honey BBQ sauce and stir until well combined. Take a pastry brush, or smear/spread with spoon, and pour and coat evenly entire rib rack, making sure to get both sides and all edges of the rib rack. Cover and cook on LOW for 6-8 hours until meat is done and tender. Once cooked, remove from slow cooker and layer on extra BBQ sauce. These look so saucy and fall off the bone. Perfect!! I have to give the slow cooker method a try! I am excitedt to have the perfect rib recipe! My family loves ribs too and I am always looking for a great recipe for them! Thanks, your picture is beautiful! These look so scrumptious, saucy and delicious, Nikki! I love how easy they are, too! This made me laugh out loud: "I am a white meat kind of gal. However, I am a white meat kind of gal married to a red meat kind of boy. Enter sob story for my husband…"
But does this ever look good, great photo and sounds delicious. Mmmmm I am SO hungry right now and these look SOOO good! I wish I could order through my screen! O my BF would love this! Maybe he might marry me at last?! haha! I am anxious to try this recipe. I love my slow cooker. Thanks and have a great day! When I was reading this I thought I was reading about myself. I feel just as you do about meat in general. If I have to trim meat, it makes my skin crawl. I am going to try these ribs though. They sound excellent. Do you know if I can make them boneless? I have some in my freezer ready to go. Jason is CRAZY about ribs so he will be so happy when I make this for him! Love that I can throw this in the crockpot too! This recipe sounds delicious! I think we all have a few of those recipe clunkers that make great stories later on. I am glad you got the chance to redeem yourself! The picture looks lovely! P.S. : On step 6 you have 'later' instead of 'layer'. Just something I noticed. I just bought a rack of baby back ribs because they were on sale and I love ribs (when done right)! I have done a rack in the slow cooker before, and they work out beautifully - perfectly fall of the bone tender. However, I opted to do an Asian style rib recipe. I'm not saying it was bad, it was simply unexpected. When I eat ribs I want exactly what's in your photograph - saucy barbecue-y goodness. I might just have to give these a try! HI! I made these last week after I saw your post and I have to say they were amazing! I've tried ribs in the slow cooker before and they've just never come out this tender before. Thanks for posting and sharing the link to Melissa's No 2 Pencil post....I've also tried bbq sauce in the slow cooker before and that has also been a fail until now....the flavors were incredible and the meat was that perfect "fall off the bone." I even caught my husband bragging to his cousin how good the ribs were hehe....thanks for the great recipe! I will definitely be sure to try more from your site!! next to the syrup but it will say pure maple syrup :) It just has more of a stronger flavor. In #2, you say place and wrap ribs? What do you wrap them in? Hello. What if the ribs aren't in rack form and are already separated? Can I follow the same recipe for those? If so is there a manner to how they should be placed in the slow cooker? Can you cook more than one rack of ribs in a 5 qt crock pot? 2 perhaps? Made these tonight for my husband's birthday. They turned out wonderful! Thank you for the fantastic recipe!!!!! I love ribs but have never had very good luck cooking them. Made your crockpot ribs tonight and they were fall off the bone delicious ! Thanks! Tried these last night. Very yummy. I used whole grain "bold" mustard. Next time, I'll substitute the honey BBQ sauce with a chipolte BBQ sauce. Like it a bit spicier, but I think I have found the recipe that I will be using from now on. The thought of cooking ribs absolutely terrifies me. I know so many people who cook "amazing" ribs that I wouldn't even feed to my dog. I guess that's not saying much because I really do care what they eat, but you get the point. My husband absolutely loves ribs and to avoid his kind rejection of yet another red meat dish I make; I've always opted not to make them. However, I saw this recipe and despite my doubts, I gave it a try...... OH. MY. GOSH. These were AMAZING! I was completely blown away myself. My husband said I've been holding out. After 10 years of marriage and I've never made ribs before and I can make them like this? Lol. Our neighbors were quite pleased as well. I used a different brand of sauce... one that actually says gluten free on it. Sweet Baby Ray's says they are gluten free, but I've been contaminated too many times by them. I used top of the line honey and maple syrup. Only because I cook with them regularly though. I didn't specially buy the stuff for this recipe. I actually used spare ribs instead of baby back ribs because that is what the store had when i went shopping. Rolled up they lined the crockpot perfectly tip to tip. Every hour I basted the ribs and half way through I actually flipped them. Your steps didn't call for this, but I was worried (since using spare ribs instead of baby back) that they wouldn't get done/tender in the given time and I was cooking on a time schedule. I cooked them for seven hours and twenty minutes. At the end I pulled them out very carefully, laid them out on an aluminum foil lined baking sheet, drizzled some more sauce on top, and slid them into the oven on broil for about 5 minutes to make the sauce thicken up and the edges darken just a little more. WOOOW!!!!!!!! Absolutely wow! 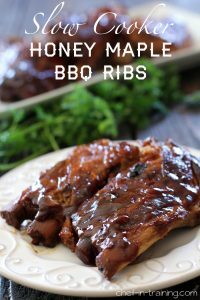 I will make these again... even though I'm personally not a big rib eater, I know far too many people who are to hold this recipe a secret! Thank you so much for the share. I'm surprised you aren't getting more feed back. You definitely need to get this recipe out there. I know it's a long comment. Couldn't help it. DELICIOUS!!! What does "Place and wrap rib rack in slow cooker" mean? Is there a wrap part left out, what do I wrap them in? no you don't wrap the ribs themselves you just place it in the crockpot along the outer edge wrapping it along side the crock pot with the curves. Does that make sense? Can beef ribs be substituted for the pork ribs? Is the mustard dry or prepared? This looks so delicious, my husband will be so happy to try this recipe. I used prepared mustard :) You will have to let me know how you like them! Delicious! We loved this! Thumbs up all around the table. I used boneless country ribs because I had them on hand. Highly recommend! Thanks for a great recipe. Don't tell Mel from Mel's Kitchen Cafe that I strayed to a new blogger ;-) You have been added to my favorites list now. I have made these 3 times now and they are delicious. Almost becoming a weekly meal they are so good. Thank you for all the wonderful recipes! hiw do you wrap the ribs and why wouldn't I put the sauce before I place them in? I just mean line the outer edge of the slow cooker with the fatty side of the ribs, having it pressed up against the side and molding the rib rack along the end of the slow cooker. Totally get how you feel about raw meat! I am the same way! I do everything I can to avoid touching it. I didn't make meatloaf for years. I have a Kitchenaid mixer and make it in that. My family loves meatloaf and I have been trying to make more things at home and from scratch as much as possible. What do you mean by "wrapping" the ribs before placing in slow cooker? Sounds and looks delish! Cant wait to try! just lining the fatty side of the ribs around the outer edge of the slow cooker. Does that make sense? Please let me know if it doesn't or if you have any further questions. I've read a few times about how to wrap the ribs..... do you have any pictures? :) I am SO excited to try this. Do you think if I used a crock pot liner it would make any difference? Made this today step by step. Instant hit, the meat fell off the bone it was so tender. The sauce was great! Thanks for sharing. I'm a fan!! I have made the. Slow cooker honey maple BBQ ribs several times for family and friends and it is always a bit hit! Simple to make and well worth the extra few pennies to buy the real maple syrup. Which kind of prepared mustard? English, Dijon, Whole grain or any of the other various types of mustard available??? Broil them for 15 minutes after you take them out of the slow cooker. It will char them a little and make the sauce super sticky. So delicious. If I'm allergic to mustard seed, do I have to pass on this recipe? Any substitution suggestions? It looks so good and I'd love to try! Hi, I made this today ... Turned out awesome!! Just one thing... I have a little too much gravy left after the ribs are cooked ... What can I do to thicken the gravy? What is a rib rack ? Do you use fresh or frozen ribs? If frozen, do you need to thaw before cooking in crockpot? for this particular recipe I use thawed/fresh ribs. Thank you for sharing your recipe. I too have never had any success with ribs. In your ingredients list do you use prepared mustard or mustard powder? Is there something else I can use besides the mustard? We are a non-mustard family. No one likes it. It's not even in the house... I have mustard powder for cooking, but they swear they can taste it even when it's a pinch.. *eye roll* ... I guess I can just omit it, but I'm sure it adds something we'll be missing. Any suggestions? Question, at the end when you pull the ribs out, do you out the same sauce mixture on them or did you just use plain bbq sauce??? Thanks!! I'm cooking them now!! I just came across this recipe and it sounds awesome. I have a question though. I have tried to make ribs before, with well not disastrous results. But I know there is a membrane on the back. My question is do you take it off or leave it? I always peel the membrane off - I think it allows the sauce to soak in better. My trick, slice the membrane at one end, then using a paper towel, grab and pull. Easy peasy! HI. I tryed your recipe last Night it was soso good, the meat fell off the bone. 4 years later, and THIS is STILL my go to for crock pot ribs! Of any kind! I love this recipe! Just wanted to come back by and say thanks, again!